According to data in the State of Inbound Sales report, social selling might be more hype than reality at this point. But the burgeoning ideas of today often become the best practices of tomorrow. Sales leaders who'd rather be ahead of the curve than chasing it would be smart to start systematizing the practice in their sales forces. Download our free guide here to learn how to use Twitter for social selling. To support forays into social selling, we've put together this massive guide, covering everything from social selling's definition to its measurement. Our goal was to have a one-stop shop for someone looking to get started with social sales -- whether as an initiative for your sales team or for yourself. And because it's more the exception than the rule, social selling can become a differentiator for sales organizations that adopt it early. Be where your colleagues aren't, and you'll get the deals they won't. Social selling is the process of researching, connecting, and interacting with prospects and customers on social media networks -- notably Twitter and LinkedIn, but others certainly fit the bill. Through commenting on, liking, and sharing prospects’ and customers’ posts, salespeople create relationships with buyers and boost their credibility by taking an interest in what they’re interested in. But data shows that those who play the long game reap the rewards. According to research from Social Centered Selling and A Sales Guy, 72.6% of salespeople who incorporated social media into their process outperformed their colleagues. In addition, socially savvy reps beat their quotas 23% more often. What does this look like in practice at a company? After adopting social selling practices and LinkedIn’s Sales Navigator, marketing software company Eloqua decreased their average sales cycle time by 20 days, and boosted the rate of leads converting to opportunities by 25%. 1) Optimize their social media profiles. We’ll cover how to do this in the next section. But be sure to optimize your profiles before you do anything else. If you begin your social selling initiative in earnest with an outdated or incomplete profile, your effort will likely be wasted. 2) Join LinkedIn groups and other relevant forums. If you have something valuable to contribute to a discussion, do it. But don’t use groups as an opportunity to hawk your products or services. Salesy comments are unsolicited, and will annoy group members just as a cold call or email would. Advance the conversation in a meaningful way, or just sit back and observe. 3) Set up social listening alerts. Use Google alerts or a social listening tool (HubSpot customers can use Social Inbox) to set up notifications about when your prospects or customers experience a trigger event, or post a possible sales opening. For example, if a prospect mentions a problem they’re having that you can address, an alert can enable you to quickly get involved in the conversation with a helpful piece of content or insight. Similarly, if a potential buyer’s company hires a new CEO or expands their business, you should comment on the trigger event as soon as possible to get on their radar. How will you know what to talk about with your prospects on social media? By reading. Check out what content your buyers are sharing, and subscribe to those channels through email or with an RSS reader. Then share the articles you think would be particularly interesting to your buyers on LinkedIn, or tweet them out. Once you’ve identified specific stakeholders you’d like to be introduced to, stop by their LinkedIn profiles and see if you have any connections in common. Then request an introduction from your mutual friend. Warm lead unlocked. 6) Subscribe to LinkedIn Sales Navigator (optional). LinkedIn Sales Navigator is a premium service priced at $79.99 per month, with a discount for annual subscriptions. The tool can help sales reps identify new leads based on location, industry, company size, and other attributes, and build a prospect list. You can view social selling trainer Kurt Shaver providing a demo of the service here. Sales reps don’t have to blog to use content effectively in social selling -- becoming an effective content curator is more than good enough. But reps who are inclined to start creating original content as a way to attract their prospects to them should. Make sure to publicize your posts on Twitter and LinkedIn, including all relevant hashtags to ensure it can be easily found. 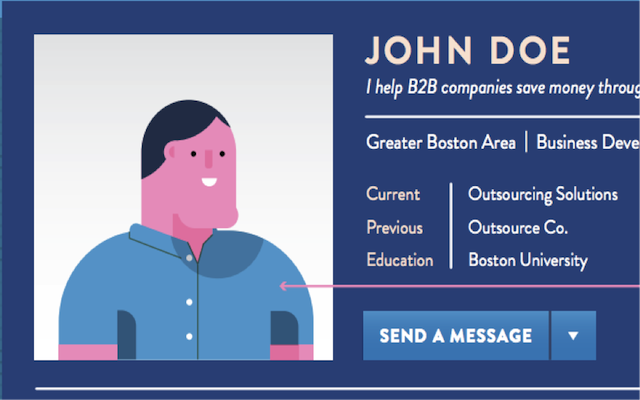 In the world of social selling, salespeople’s social profiles should be more than digital resumes. They should actively help you cultivate a reputation with your buyers as a trusted advisor who can bring fresh insights to their business. For this reason, you should redo your social profiles to change the intended audience from recruiters to potential buyers. Link to your company’s Twitter account (Example: Sales Rep @company). Include hashtags that your buyers follow. 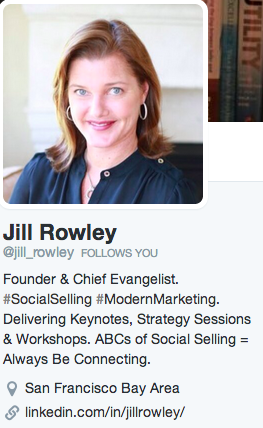 For a phenomenal example of a social selling-optimized Twitter bio, check out Jill Rowley’s. Rewriting your LinkedIn profile is more labor-intensive, but it’s an extremely valuable exercise. A good question to ask yourself while working on your profile is “would my target buyer care about this?” If the answer is no, it should probably be scrapped. Have a current, hi-res picture. According to LinkedIn, profiles with pictures get a 40% InMail response rate. Make your headline a mini value proposition. Don’t just use your title. Craig Rosenberg suggests answering two questions in your headline: Who do you help, and how do you help them? Write a 3X3 summary -- three paragraphs with three or fewer sentences each. Reiterate your value proposition in the first, and provide some social proof of how you help clients achieve results in the second. Include a concise call to action in the last that explains why and how a buyer should reach out to you. Post a few pieces of visual content that will be helpful to your buyer. Write the experience section with an emphasis on how you enabled customers to improve their businesses -- not how many times or by how much you exceeded quota. Seek recommendations from customers to increase your credibility. Join groups that your buyers are in. Social selling is all about engagement. But bear in mind that social networks should not be treated like a new platform on which to spam. Your interactions should be thoughtful, relevant, and personalized. Social engagement comes in four main forms: sharing content, liking, commenting, and connecting. Post content that your target buyers will be interested in, and post it often. But don’t just link to your company’s content. Jill Rowley recommends getting down with “OPP” -- other people’s content. Switching up your sources will nix the perception that you’re self-serving. Phil Harrell, chief revenue officer at Firecracker, shares interesting content to his target buyer on both his LinkedIn and Twitter pages daily. 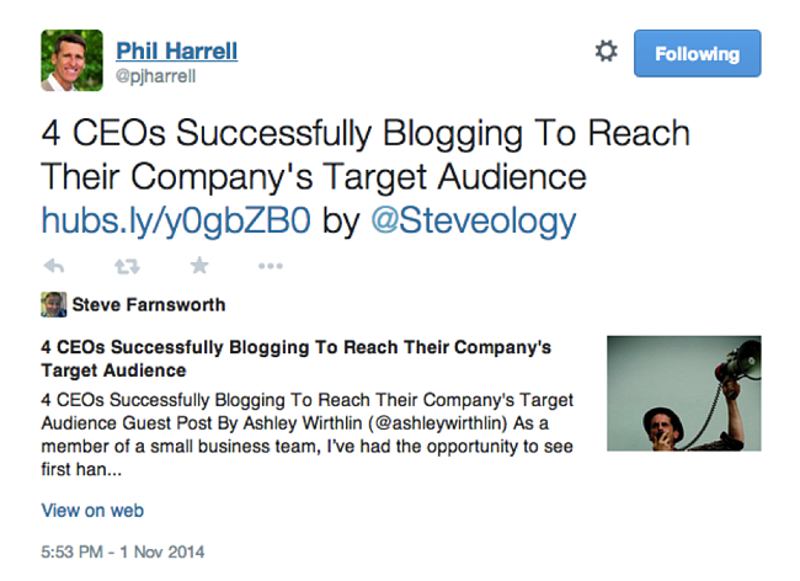 And while he shares posts from the HubSpot blog (thanks, Phil!) he also promotes a good mix of publications and authors. When you don’t have time for a comment, or don’t have anything substantial to add, a LinkedIn like or Twitter favorite works just as well. 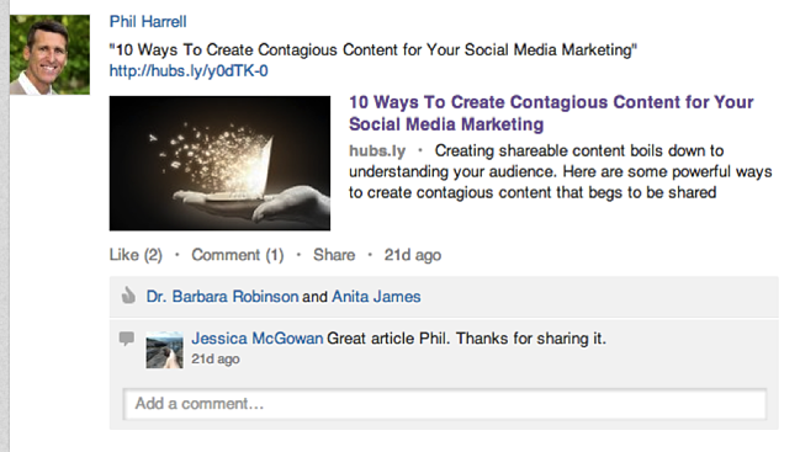 Likes also work as “thank yous” when others share or retweet your content. They don’t take long, so don’t be stingy. A comment should not just be a sales pitch or a link to your company’s website. It should be a thoughtful and thought-provoking response to an article. This example kills two birds with one stone. 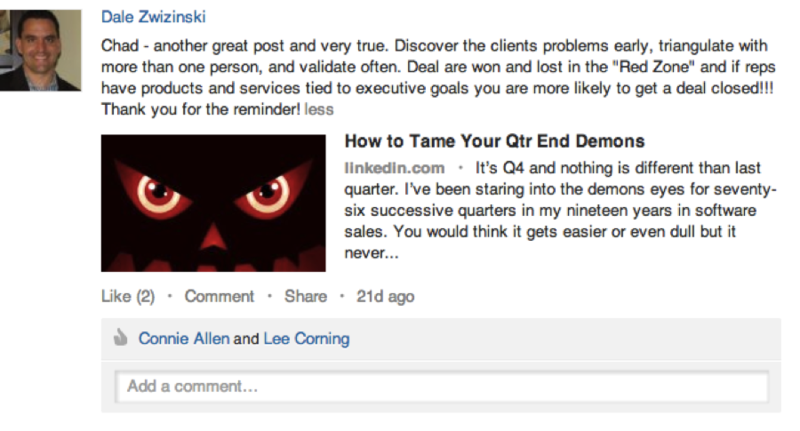 Dale Zwizinski, senior account executive at Revegy, not only shares a post that his target buyer would care about, but adds an astute comment as well. On Twitter, you can follow prospects to your heart’s desire. But on LinkedIn, you should be more judicious. 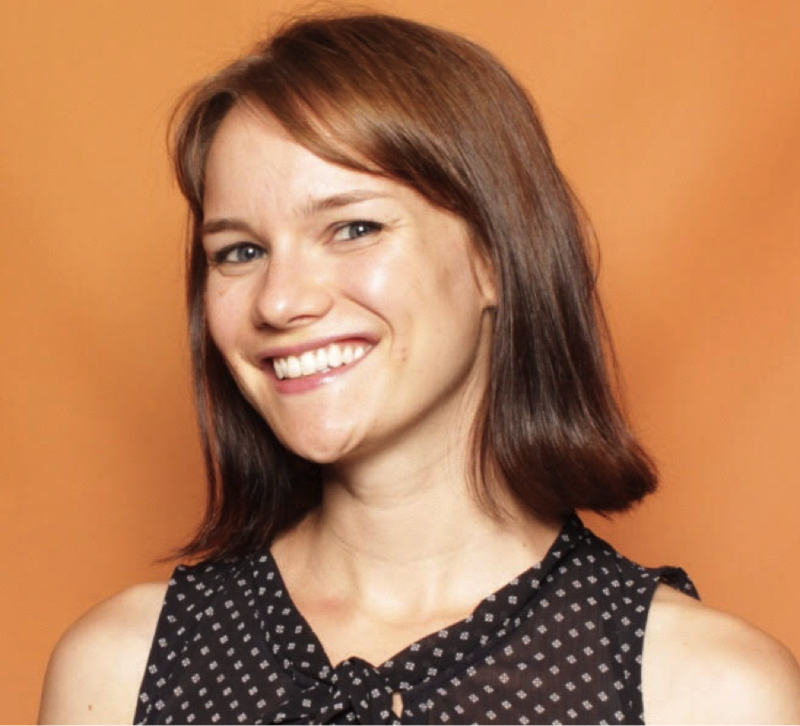 A good rule of thumb is to not request someone until you’ve had a meaningful interaction -- either in person or online. Only then is when it’s acceptable to send a personalized invitation, explaining why you’d like to be in their network. Reference a blog post the person wrote or a piece of content they recently shared to show that you did your research. One of the most significant perceived hurdles to adopting social selling is that is takes too much time. How can sales reps keep up with their buyers on LinkedIn and Twitter when they’re also trying to, you know, sell? Like anything else, developing a routine around social selling will cut down on the time commitment. An infographic from Ben Martin walks readers through such a process that only requires a half hour per day. Many reps are hesitant to adopt social selling because they fear it will come off as "creepy" to buyers. After all, nobody likes the feeling that they're being researched by people they don't know. Salespeople sometimes worry that starting a cold email with "I noticed on LinkedIn that you ... " or "I liked your tweet about ... " might scare prospects away instead of draw them in. To determine how "creepy" social selling truly is to buyers and consumers, HubSpot conducted a survey that asked prospects about the creepiness factor surrounding specific tactics. The overall opinion was that social selling is not creepy. However, the split was closer to 60/40 than 100/0. Buyers and consumers are less likely to perceive social selling interactions as creepy if they share connections with the salesperson. Customized messages are on the whole perceived to be less creepy than generic messages. Facebook is the creepiest network for social selling by a mile. "Light" social selling interactions (liking, favoriting, retweeting) are considered to be less creepy than more in-depth interactions, such as messaging or commenting. Buyers’ and consumers' self-reported preferences about salesperson behavior and their gut reactions to sales practices are sometimes at odds. To the last point, the data unearthed a cognitive dissonance between what buyers and consumers say they want and what they actually want. Download the study report to explore this critical finding further. Measurement is arguably the hardest part of a social selling initiative, because the effects aren’t linear. There’s no formula (yet) that correlates the number of content shares or likes with number of deals closed. But this doesn’t mean that social selling can’t be measured at all. The majority of the metrics available today assess an individual’s social selling aptitude, such as LinkedIn’s Social Selling Index and Klout scores. On a larger scale, a company can also opt to add a “social” source of deal options to their CRM softwares to see how many customers are coming from social selling. Sales leaders who’d like to conduct a study within their organizations on how social selling translates into sales should first systematize the practice and train reps on social best practices. They can then measure what impact -- if any -- the new routine has on deals closed by comparing future results to historical numbers.